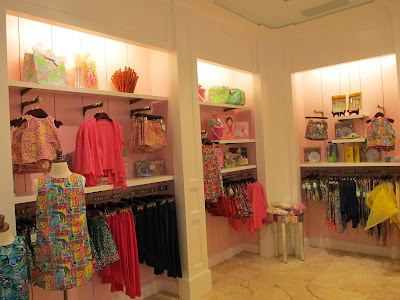 Whenever I travel to a new city, I love to visit the local Lilly Pulitzer store. Raleigh, North Carolina is home to Palm Avenue, a fabulous Lilly Pulitzer Lifestyle store. This store is so special because it is the first (and only) Lifestyle store. The concept of the Lifestyle store is a place where Lilly lovers can find everything they need from fashion to furniture. As you enter Palm Avenue, you’ll immediately be drawn to the gorgeous pink Chinoiserie style dining room in vibrant pink. The staging of the large store space is spectacular. Orange is one of the best selling colors for home furnishings at the store. This living room is fun and I like the color combination. The Chinese style is a common element in the prints, accessories, and details of the collection. Everything about this living room area is so gorgeous, from the Lilly Pulitzer fabric to the Trina Turk accent pillows. All of the furniture and accent pieces are for sale. I was seriously tempted by the white elephant beside the chair. Of course, you can customize the home collection with a myriad of gorgeous prints that will match any décor. 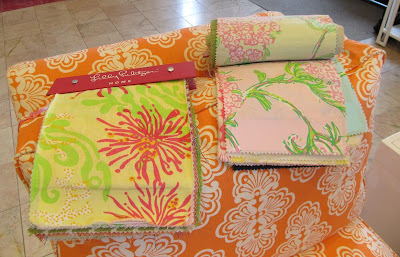 I could sit all day and look at the Lilly Pulitzer home fabric swatch books! 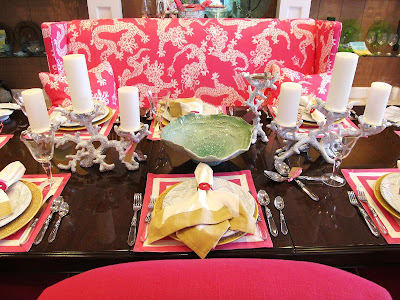 I have seen the home collection online at Neiman Marcus and Horchow and was surprised to learn that Palm Avenue’s prices were significantly lower. 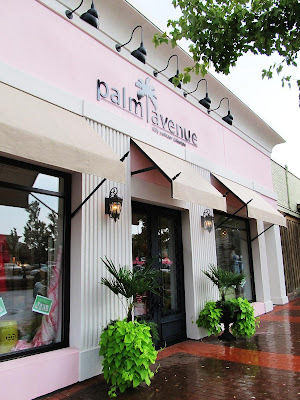 The peeps at Palm Avenue are incredibly friendly, too, and that will make your experience 1,000 times better because you'll have interaction with a real (very cool) person. The home accessories are also very reasonably priced. 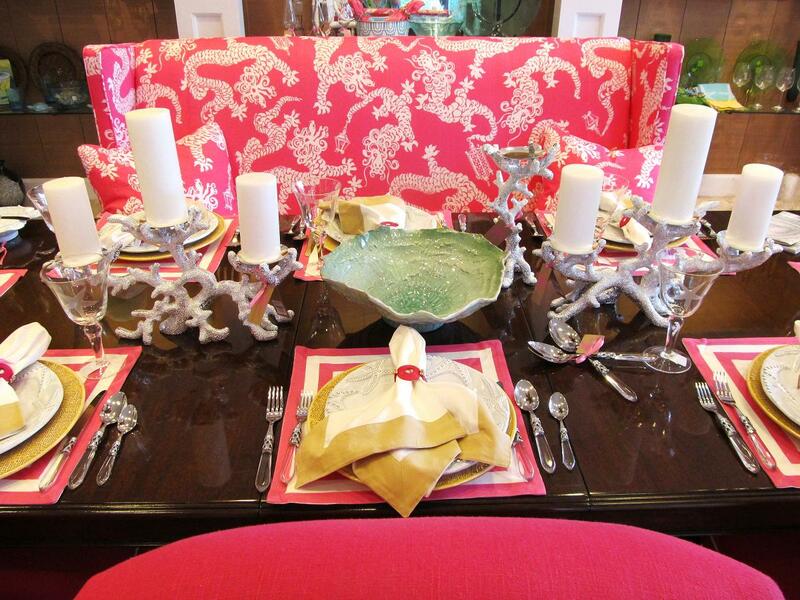 I love the Lilly Pulitzer tablescape...especially the coral candlestick holders. 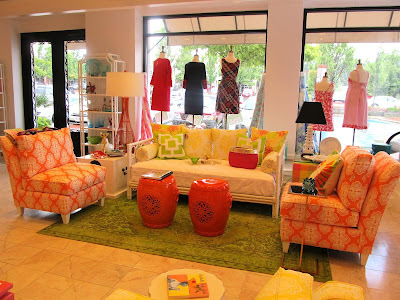 Palm Avenue has the first shipment of Lilly Pulitzer Fall 2011 and let me tell you, it's gorgeous! So many of the pieces are work appropriate, too. I'm glad to see the return of the Stephanie shift, the Jonah, and a shirtdress that seems a little bit more refined than last year's Brinkley. One of the peeps at the store was wearing the dress and she looked amazing! The minnies' fall is adorable and gets 4 thumbs up from my girls! Palm Avenue also has a fabulous selection of jewelry, shoes, and other accessories. 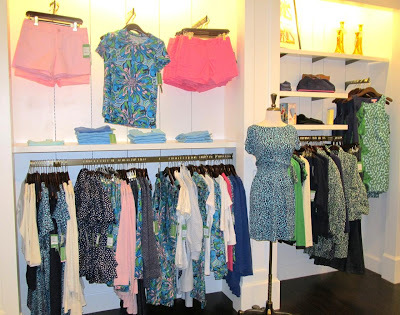 The store is located in Cameron Village in Raleigh, North Carolina. You can find them on Facebook or call the store directly at 919-828-2980. Thanks to the kind ladies at Palm Avenue for their hospitality. 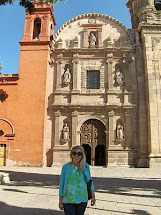 I'm eager to plan another visit! *sigh* I loooove it all!!! I want a lilly house so badly!! Just gorgeous! oooh .. you are so lucky to visit this new shop! Love it .. and yes.. isn't the fall line fabulous?! I wish I had known you were coming to NC! I live in Raleigh and CV is about three miles from my house. 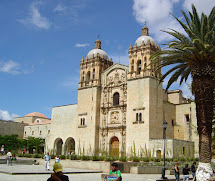 I would have made a trip to see you! 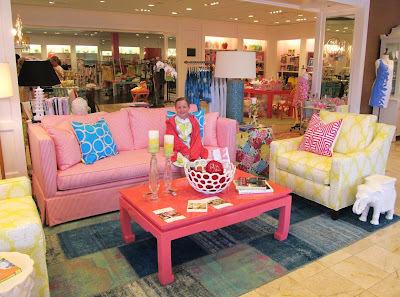 One of the best Lilly stores I've seen - love that so much of the Lilly furniture is included and on display! 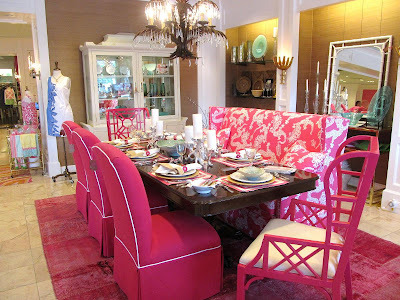 The furniture is TO-DIE for! Love all of the colors...so fabulous! Caitlin ~ Yes, my nephew's christening was this weekend. So much fun. sle ~ Oh yes!! I'll let you know the next time I'm in the area. My sister lives in Cary. LOVE it! I can't wait to visit the store! Swoon!! 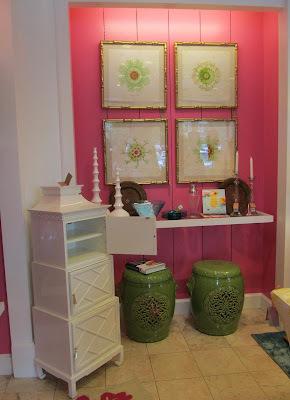 That's always the first word that comes to mind when I see how darling the Lilly Pulitzer home collection is. 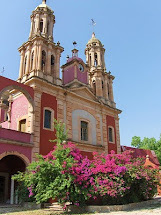 If money were no object, my entire house would be filled with the pink and green, top to bottom. That's my local store! But honestly I've been buying more Lilly online or at the Crabtree Belk of recent. Glad you had fun here!